This centre is close to many upmarket hotels, as well as shopping hot spots, restaurants and cafés. This is a prime location for our business centre, which offers a range of office solutions to suit your needs. 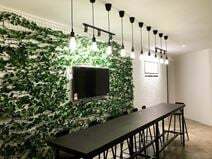 In the most vibrant and established commercial district outside of Georgetown City Centre, this co-working centre has a prime location fitted with everything that your business needs to succeed from high-speed internet connection, to administrative support, to access to board rooms, private phone booths, and event space. Well connected to food and beverage facilities, hotels, retail venues and everything else that you may need on a day to day basis. This fully-furnished office space is on offer in Penang's Georgetown Central Business District - just a stone's throw from Menara Boustead. Based within a 22-storey, Grade-A building, you can benefit from all the flexibility this serviced office can provide, with the added bonus of local amenities including cafes, restaurants and shops. Local buses stop nearby every 30 minutes, and Butterworth KTM station is less than four miles away. Office space prices ranging from RM380 - RM899 per month. The centre is in Lebuh Lintang and which is surrounded by banking and postal facilities, restaurants, cafe, five shopping malls and hotels which is a great access. The centre provides projector, storage & locker, comfortable facility, game room, well stock pantries, business class printer, Inhouse tech support and phone booth for members daily office use. Besides, it opens everyday to fit your needs. As well as the co-working space available here there are also private offices available, training rooms for up to 30 people and meeting rooms for up to 10. Located in the heart of Penang City within the UNESCO World Heritage Site and the banking and financial district.